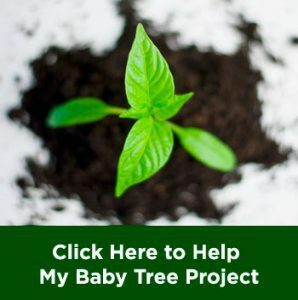 Human population keeps increasing day by day, and the increase of human population means that the demand of food supply will increase as well. That’s why, nowadays, people who work at food production industry always try to increase the food production in shorter time with some shortcuts. However, the shortcut in the production of food supply such as livestock and agricultural deeds tend to put pressure to the nature. The use of pesticide, chemical fertilizers, genetically modified foods, or chemical foods for the livestock may harm the environment. That’s why to fulfill the needs, people need to find alternative food that is eco-friendlier. Let alone in the far future, predicted to be in 2050, the population of human will reach about 9 billion people. Imagine how to feed all of them. Among any alternative foods, scientists suggest that insects are the best alternative source of food. It contains protein, vitamins, and amino acid which human need. Let alone the fact that insects need far less feed to produce the same amount of protein as livestock. While it may seem gross for you, but actually there are many countries in this world that already used insects as food source, and there is huge variety of insects that can be eaten. Thailand is the most famous one with its edible insect market in Bangkok. 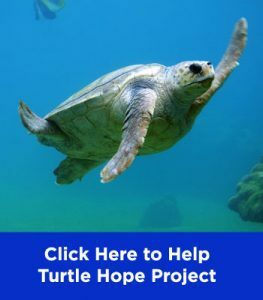 Here is a list of some edible insects and some recipes that you might find interesting and yummy. The tradition to eat this bug can be found in countries such as Thailand, Mexico, and Cambodia. Cricket is known to contain high amount of protein. The recipes are also various since it can be sautéed, fried, boiled, or roasted. 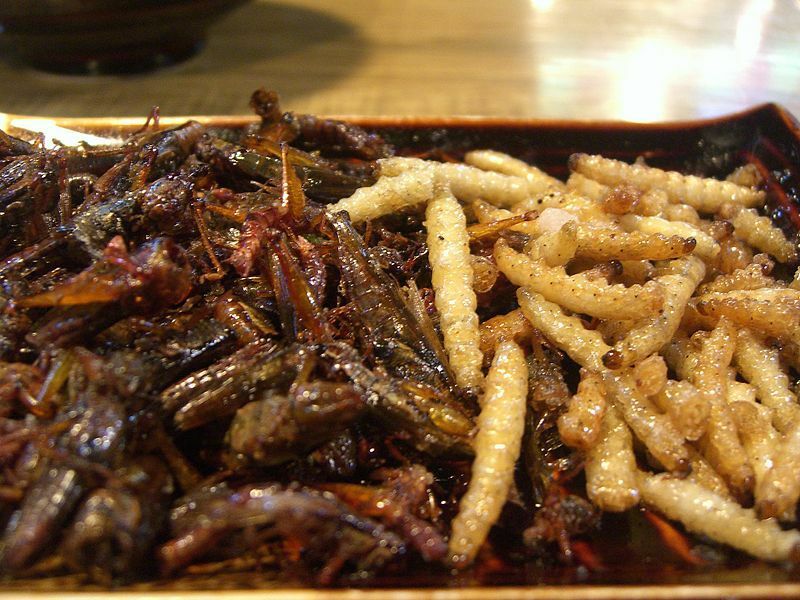 Fried cricket is the simplest way to eat it. Because cricket has its own sweet and savory natural taste, you can just fry it directly without additional seasoning. But some onion, salt, pepper, and garlic will add more taste to fried cricket. Like stated in Cricket Care, you can just simply heat olive oil, butter, or vegetable oil in a pan. Put the cricket, maybe with minced onion or garlic, in the hot oil and fry it until brown and crispy. You can pour salt or pepper as you wish to add more taste. The same as cricket, this insect is another source of high amount of protein. 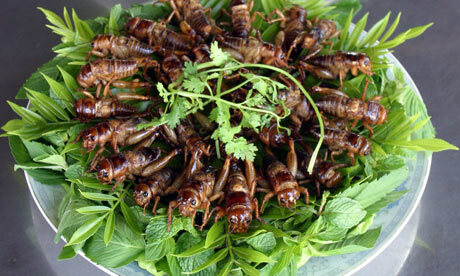 The culture of eating grasshopper can be found in many countries in South East Asia and all around American continent. In Mexico, grasshoppers are usually eaten roasted with chili and lime known as chapulines. 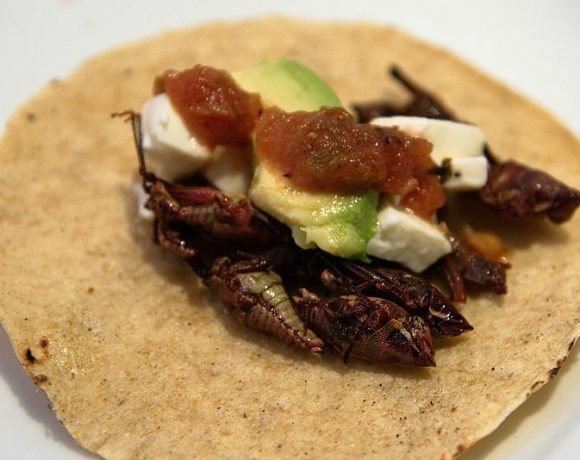 To make chapulines, you need big number of grasshoppers, just because it tastes so good that you might don’t want to stop eating. Clean the grasshoppers thoroughly and fry them with chili and lime as its seasoning. Fry until it turns brown and crispy then it is ready to be served. Silk worms can be consumed after they stop producing the silk and is usually the byproduct of silk harvesting industries. This worm contains high amount of fat, protein, and amino acid which is good for us. 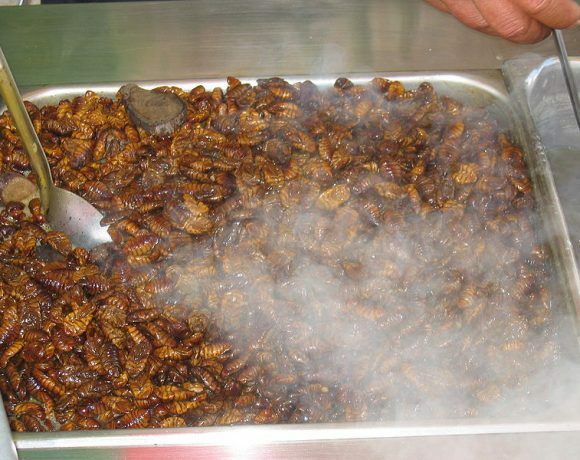 In Korea, there is a dish named Beondegi that is made from silk worms. Beondegi is a popular street food in Korea that usually be sold in paper cup or canned. Beondegi itself is usually steamed or boiled silkworm. There is a recipe of Beondegi that will eliminate your disgust to eat it. This recipe is derived from 500Sandwiches. You can boil and steam the silkworm first, or just use the canned one to make it simpler. Drain the excessive liquid and soak the silkworms in fresh water for one hour. Do this process two more times and then soak dry the silkworm. Marinate the dry silkworm in a sauce made from soy sauce, sesame oil, and minced garlic, you may add Sriracha for more flavor. Let it sit for 30 minutes while you heat the oven to 250 degrees Celsius. Drain the Beondegi from the margination liquid and roast it in the preheated oven. Roast for 45 to 60 minutes while shake the baking sheet every 10 minutes to make sure the Beondegi is well cooked. After it is cooked, sprinkle salt and pepper as you wish and the crispy Beondegi is ready to be served. This larva of mealworm beetle can be found almost anywhere in this world. While it is usually fed to pets, but actually mealworm is edible too to human. Mealworm is often served in boiled, sautéed, fried, or roasted form. Here is a recipe of healthy snack made from mealworms from Ground to Ground. 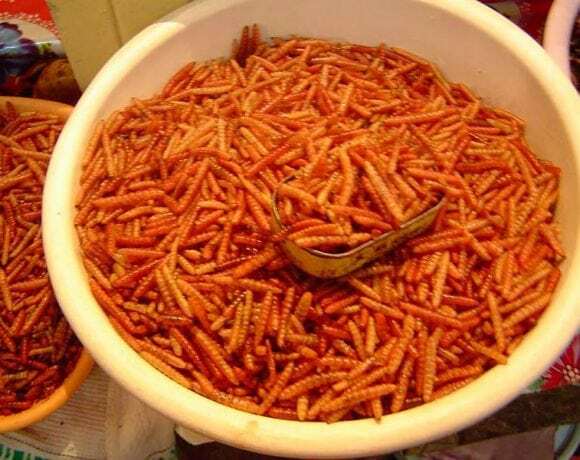 The ingredients are simple, you need to prepare mealworms, chili peppers, garlic, and butter. Melt the butter until melted and add the sliced chili and the minced garlic. Sauté until the aroma bursts out then add the mealworm. Fry until it turns crispy and season to taste. You can also use mealworm for Mealworm Marinade. The ingredients are just mealworm, chopped parsley, lemon juice, tabasco, a pinch of pepper, and sliced garlic. To make it, mix all the ingredients in a container. Close the lid and put it in the freezer for at least 3 hours and you can eat it raw or cook it as you like. In eastern part of Indonesia where sago is the main meal, people also consume the grubs that can be found inside the tree as side dish. Sago grubs is alternative source of fat for those people. This dish can be eaten raw, and some say it tastes like bacon. One of the famous dish from Indonesia is Sate Ulat Sagu or Sago Grubs Satay and to make it is pretty simple. 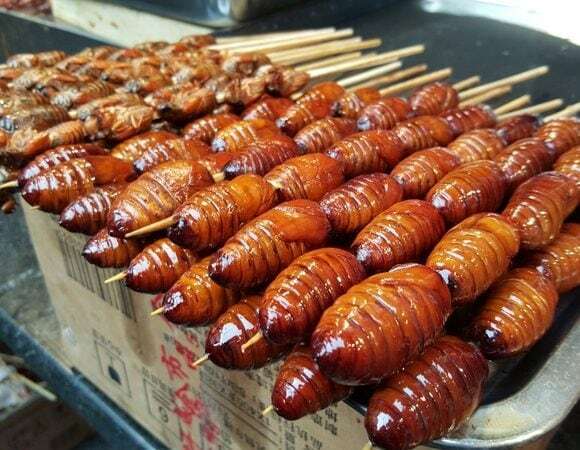 The cooking process is to grill the sago grubs in stick like making barbecue. While grilling, make the sauce by mixing chili peppers, soy sauce, shallot, diced tomato, and lime water. Grill the grubs until it turns brown while smearing it with the sauce once in a while until it turns brown. The sago grub satay is ready to be served. Those all some yummy dishes you can make from insects. There are many other recipes that you can make at home you can find in the internet. So, dare to try one?